Preheat oven to 350°F. Cook pasta shells according to package instructions; drain and return to pot. Add milk, butter, and 1 cup of cheese to cooked pasta along with cheese packets from the macaroni boxes. Stir together over low heat and season with salt and pepper. 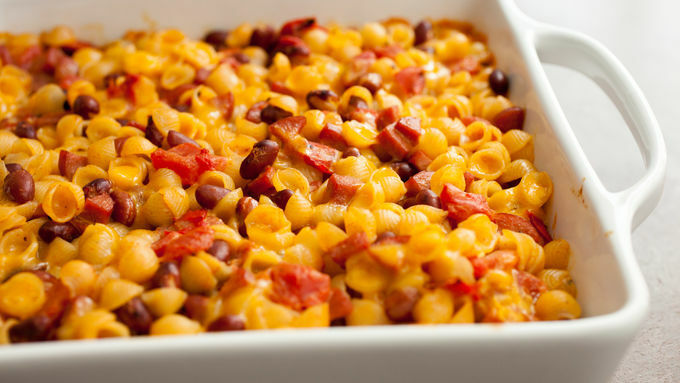 Add hot dogs, diced tomatoes, beans and 1/2 cup cheddar to the pot of macaroni and stir well to combine. Transfer mixture to an 8x8-inch baking dish and top with remaining 1/2 cup of cheddar cheese. Bake 15-20 minutes until all cheese is melted and casserole is heated through. What kid doesn’t love macaroni and cheese? Despite all my efforts to expose my two-year-old son to different foods, it’s still a top three meal for him. Go figure. I have to change it up occasionally though or I just get bored. 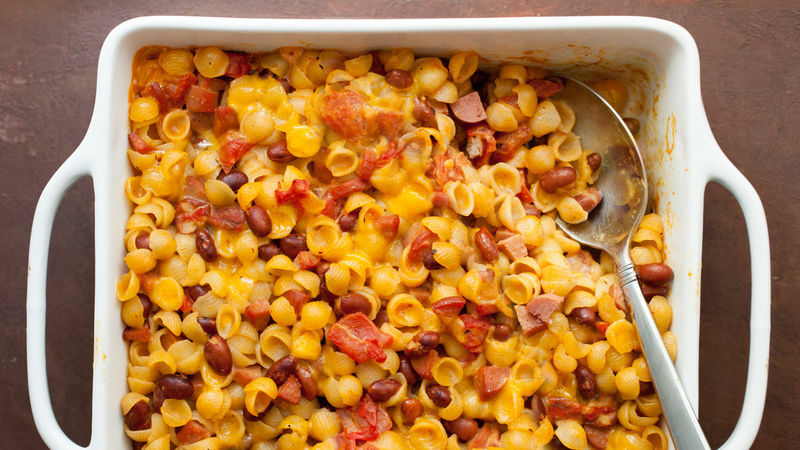 Enter this quick and simple chili dog-inspired pasta bake. The chili ingredients go really well with cheddar cheese and hot dogs and are such an easy addition. You could jazz it up further with your favorite sauce—a little BBQ, ketchup or hot sauce on top would be perfect. You start by cooking the pasta shells as directed on the package, but that’s as far as you follow those instructions, because we’re not making just any old mac and cheese. 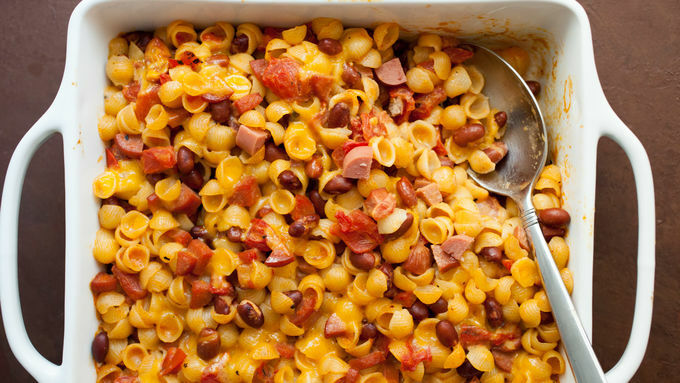 The recipe above calls for more milk and butter than the box does; then we load it up even more with shredded cheddar, diced tomatoes, red beans and diced hot dogs. To be honest, it’s perfectly edible just like this, but to really take things up a notch, I recommend transferring the mixture to a baking dish and topping it with even more cheese before popping it in the oven. Baking it really lets all the flavors meld together and makes for one delicious mac and cheese casserole. Kids love it. Adults love it. You gotta try it!